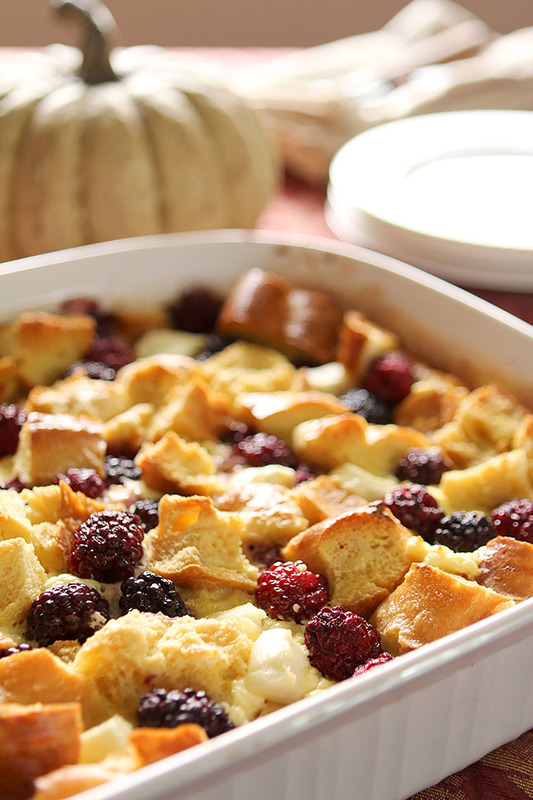 Really all I want to share is that you need to have this Blackberry and Cream Cheese Stuffed French Toast for breakfast on Thanksgiving morning. Or Christmas morning. Or any holiday morning. Or birthday. Or…well you get my drift right? We not only love this immensely for the great breakfast dish it is but that love is quadrupled because you make it the night before and in the morning just pop it into the oven while folks gather in the kitchen for one of those wonderful family moments. Or even if you’re alone; which is not so bad because than it will be all yours and you won’t have to share. I’ve made this for years using the recipe from ‘Colorado Collage’ one of the series of cookbooks put out by the Junior League of Denver. Until recently I’ve never messed with success and stuck to their recipe for Blueberry and Cream Cheese Stuffed French Toast, however, I wanted to make this for a breakfast dish when I had some girlfriends over for a slumber party (oh yes we did!) and I didn’t have quite the ingredients I needed so I punted and loved this version just as much. The big difference was in the cheese; I thought I had a couple of packages of cream cheese in the refrigerator but I was so wrong so this version uses a blend of cream cheese and goat cheese and we loved it. A lot. I also used blackberries instead of blueberries for the fruit and it was another great fit. I can see this with a variety of berries, so just use what is in season and/or what you love. Adding a bit of maple syrup to the sauce was another good move; blackberries are more tart than blueberries and that extra bit of sugar was perfect; both for the flavor and extra sweetness it needed. While I have always loved serving this Blackberry and Cream Cheese Stuffed French Toast on holiday mornings especially because of the ease that comes from that ‘night before prep’ thing; the truth is that I didn’t get that done this past weekend and ended up making it the same morning that I baked it. I let it sit for about 15 minutes so that the bread could absorb some moisture before we baked it but given the right circumstances and a bit more time, there was no discernible difference with the fabulous end result. If you’re not a fan of goat cheese; no problem. Simply use all cream cheese. But do serve it with the homemade blackberry syrup; it is most definitely an ‘oh yum’ moment! A great make ahead dish the night before for a special breakfast. 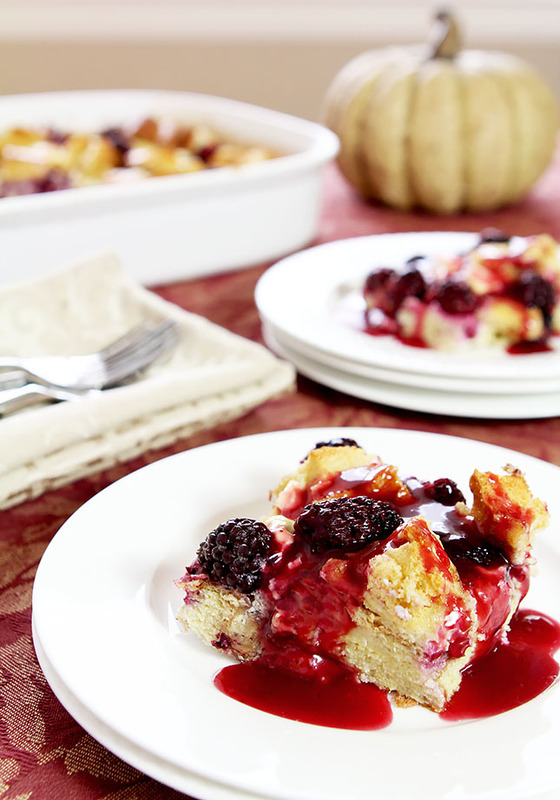 Scatter cream cheese cubes and crumbled goat cheese on top and sprinkle with blackberries. Combine eggs, syrup, milk and vanilla and pour over bread mixture. Add 1 cup of Blackberries and simmer, stirring occasionally, about 10 minutes. Add butter and stir until melted. Add maple syrup and stir to combine. Mash berries or use a stick blender until syrup is smooth. Strain seeds if desired. Transfer to a small pitcher or serving bowl. 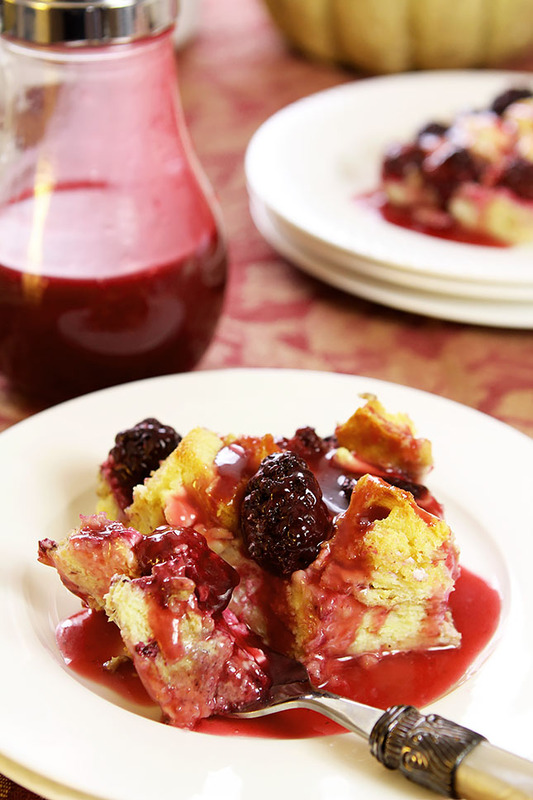 Place French Toast on individual serving plates and top with Blackberry Syrup. Oooh, I can’t wait to try this recipe!!!! This is the sort of thing I love to have for a big family breakfast when the out of towners are here. They’ll be here soon and this will be on the menu. I wish someone would make this for me. How fun to have a sleep over. I finally made it to Snooze last week for the first time and had a French toast with similar flavors. Thanks for this recipe so I can make it at home for a crowd. Perfect for the company we have coming this Christmas. well I don’t think I can wait for a holiday morning for this. It looks fabulous! Seems perfect for company but in truth it’s easy and good anytime!